Deadline for registration is Dec 20 2018. Participants who register for flash talks will be recontacted to upload their slides. Participants who do not intend to present a talk do not need to register. A conference aims to bring together a broad range of physical and life scientists working at the interface between the two disciplines around in-depth talks by first-rate international speakers. Attendance will be limited to 200 participants. We look forward to welcoming you in Gif-sur-Yvette! A conference in honor of Luca Peliti for his 70th birthday. This is will be the opportunity to gather both mathematicians and physicists working on Random Matrix Theory. The understanding of collective quantum phenomena in condensed-matter systems has been a central topic in physics, since the beginning of the 20th century and the discovery of superconductivity and superfluidity. For some long period of time, two important ideas lead the understanding of the quantum states of matter: the Ginzburg-Landau theory of phase transitions (based on [broken]symmetries and their associated order parameters), and the Landau theory of Fermi liquids (based on weakly interacting quasi particles). But since the discovery of the quantum Hall effects in the eighties, it has been understood that many materials realize some new states of matter that cannot be characterized using conventional (Landau) order parameters and for which some fundamentally different approaches are required. In most of them, topology is playing a crucial role. These new phases, and the associated theoretical tools, are not only relevant to describe the low temperature phases of the electrons (or their spins) in some particular solids, but they are also relevant to some “artificial” quantum systems, such as trapped cold atoms or nanofabricated superconducting arrays, which both could be engineered to realize some topological phases. All these systems are both fascinating from a conceptual point of view, as they challenge our views on many-particle systems and quantum mechanics, but they could also lead to new types of devices and applications. Electrophoretic phenomena are relatively well understood. However, progress in numerical modeling of other phoretic transport phenomena is hampered by the lack of a well-defined statistical mechanical formulation. The present CECAM flagship workshop focusses on understanding the physical origins of the phoretic phenomena and on predicting the flow in nanoconfinement in diverse experimental applications such as water filtration, blue energy, oil recovery and protein characterization. We will build upon previous successful workshops, which explored the fundamentals of transport at the nanoscale and the issue of finite size scaling in simulations (Zaragoza 2015, Paris 2017). In this workshop, we aim at bringing together leading scientists working on the fluid flow in nanoconfinement and in thermodynamic gradients with theoretical, computational and experimental background, as well as industry representatives. In such multidisciplinary setting, we intend to discuss both, the open fundamental issues and the novel emerging technologies based on exploiting phoretic phenomena. April 13th, 2018, M.I.T. McGovern Institute, Cambridge, MA. Bringing together experts from physiology, sports medicine, engineering and physics to explore current and future directions in this newly emerging interdisciplinary field. The main purpose of the workshop is to discuss the recent progress in the field of quantum integrable lattice models, integrable quantum field theories and exactly solvable models of statistical mechanics and their connection with many different fields of Physics and Mathematics. The workshop will be organised at the ENS-Lyon from 23rd to 26th October 2017. *We invite you to participate in the **MGO2017 Workshop - *“*Modelling of 3D Genome Organization - Integrating genomics and microscopy data*” that will be held in *Gif-sur-Yvette* (France) *on **October 2-3, 2017**(2 half days)*. The tri - annual meetings ECRYS aim to provide cross-links between various studies of spontaneous structures formed by electrons in solids, with extensions to related systems such as charged objects in soft matter and biology, vortices in superconductors, ferroelectric and magnetic domains, mixed and spin-polarized states in superconductors, patterns in condensates of excitons and cold atoms. Unifying concepts and phenomena emphasize a complex of nonlinear nonstationary spacio-temporal effects, role of topological defects and microscopic solitons, effects of long range Coulomb interactions. The international summer school "Fundamental Problems in Statistical Physics" is to be held for the fourteenth time in the summer of 2017 in Bruneck, a picturesque town in the Italian Alps. We are pleased to announce the XXIX IUPAP Conference in Computational Physics (CCP2017), which will be held in Paris from July 9th to July 13th, 2017, in the Jussieu campus (Latin Quarter) of the University Pierre et Marie Curie - Sorbonne. Submissions are open at https://ccp2017.sciencesconf.org/user/submit. Please note that you need to create an account on the conference platform (free of charge). 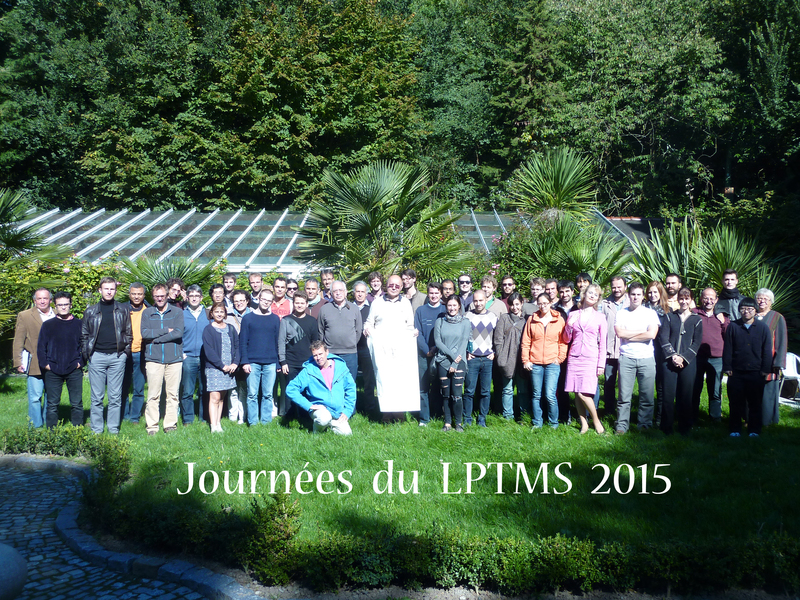 In honour of Françoise Livolant, the LPS (Laboratoire de Physique des Solides) and LPTMS (Laboratoire de Physique Théorique et Modèles Statistiques) are organising an international conference on geometry and interactions in self-assembled biological systems. The 3rd International Conference on Physics and Biological Systems will be held on October 24-26th 2016 at École polytechnique in Palaiseau – greater Paris area. It aims to bring together a broad range of physical and life scientists working at the interface between the two disciplines around in-depth talks by first-rate international speakers. Attendance will be limited to 150 participants. We look forward to welcoming you in Palaiseau! This conference aims at developing the French-Russian interaction at the mathematical/physics interface. There is a long tradition in both countries in mathematical physics. The cooperation is also very active as exemplified by the existence of Laboratory Poncelet, which is a joint French-Russian laboratory. The first French-Russian conference on Random Geometry and Physics was held in Moscow at the Steklov Mathematical Institute, September 8-12, 2014. This second French-Russian conference Random Geometry and Physics, now held at Institut Henri Poincaré in the center of Paris, coincides with the 50th anniversary of official scientific ties between France and the former USSR. The interface between combinatorics and random geometry on the mathematical side and quantum field theory and statistical mechanics on the physics side is in fast development in France and Russia. For instance the 20th Itzykson conference "Random surfaces and Random geometry", held in Institut de Physique Théorique at CEA, June 10-12 2015 was entirely devoted to this subject. New methods have recently emerged such as combinatorics of maps and random tensors. Since they imply new forms of integrability, they could greatly benefit from the corresponding leading expertise in Russia. The goal is also to encourage the new generations of French and Russian mathematical physics to know each other. Hence there will be equilibrium between seniors and young speakers. The conference might also lead to new PhD cotutelles, postdoc exchanges, and various other collaborations, extending beyond the traditional channels through the Russian diaspora in France. Recent decade witness a new activity in condensed matter physics. The goal is a controlled transformation of electronic states or even of whole phases by external impacts. There are two main directions: the electrostatic effects of very strong electric fields and the supercritical optical pumping; the latest trend is to employ them in combination. The goal of IMPACT 2016 is to reach a synergy and cross- fertilization between the branches of the new science which still lack an acquaintance – with respect to the two major techniques, but also on different classes of materials. A formidable task of understanding the interplay of coherence and interactions in disordered systems attracted researchers over many decades. The key milestones in this area include the introduction of the influence functional approach in the '80, the powerful numerical techniques developed in the '90s, the concept of entanglement applied to this problem in the '00s and the recent advent of many-body localization.This interdisciplinary workshop aims to attract experts from diverse fields to discuss a broad range of phenomena associated with the interplay of disorder, interactions and quantum coherence. Also it will be a good opportunity to honor 50 years in science of David “Dima” Khmelnitskii. For more than 50 years Bernard Jancovici enthusiastically devoted himself to research in physics. After his first works in nuclear physics, he turned to statistical physics from the point of view of first principles and solvable models, with a particular interest in Coulomb interactions. His contributions in this field earned him an international recognition, while his pedagogical and brilliant lectures made him a well-known professor in the universities of the Paris area. The conference is aimed to provide an overview of the approach he promoted through the presentation of current research achievements in statistical physics that go beyond Bernard Jancovici's favorite subjects but share the same quest for analytical results from first principles. The conference will be held at the Institut Henri Poincaré (Paris 5th district) where Bernard Jancovici gave his Master's lectures on statistical physics during several years. Fabian Bohnet-Waldraff — How much quantumness is there in a spin one state ? The connections between stochastic processes and random matrix theory (RMT) have been a rapidly evolving subject during the last ten years where the continuous development of new tools has led to an avalanche of new results. The most emblematic example of such successful connections is provided by the theory of growth phenomena in the Kardar-Parisi-Zhang (KPZ) universality class. Other important instances include non-intersecting Brownian motions or processes governed by "1/f" noise, which are at the heart of disordered systems exhibiting a freezing transition. These breakthroughs have been made possible thanks, to a large extent, to the recent development of various new techniques in RMT. The goal of the school thus is to present the state of the art concepts of the field, with a special emphasis on the large spectrum of techniques and applications of RMT. Finally an important aspect of this school is that the topic of stochastic processes and RMT is at the interface of statistical physics and mathematics. Therefore this school aims at bringing together students (and researchers) from both communities. The meeting will be focused on spin relaxation processes in paramagnetic systems and their role in spin hyperpolarization experiments. Les deux journées réuniront mathématiciens et physiciens théoriciens autour de thèmes variés reflétant la diversité qui a marqué la trajectoire scientifique d’Alain Comtet, parmi lesquels la physique statistique des systèmes désordonnés, les processus stochastiques ou les matrices aléatoires. Professeur de l’Université Pierre et Marie Curie qui a marqué plusieurs générations de physiciens, Alain Comtet a notamment été le cofondateur et premier directeur du LPTMS, ainsi que le co-directeur de l’Institut Henri Poincaré. Le colloque se tiendra à l’IHP, lieu symbolique qui représente les liens forts entre physique théorique et mathématique chers à Alain Comtet. ECRYS-2014 continue the series of tri-annual conferences ECRYS on Electronic Crystals, which have been organized since 1993 in France. The event will be held by the Institut d'Etudes Scientifiques de Cargèse, Corse, France (http://www.iesc.univ-corse.fr). The 2nd International Conference on Physics and Biological Systems will be held on June 24-27 2014 in Gif-sur-Yvette, in the south of Paris. It aims to bring together a broad range of physical and biological scientists working at the interface between the two disciplines around in-depth talks by world-class speakers. During more than 50 years since the discovery of Anderson localization of particles, the physics of disordered quantum systems underwent tremendous developments. At present, the localization of interacting particles remains one of the global problems in condensed matter physics. The key issues concern metal-insulator transitions in mesoscopic systems, electron-phonon interaction and transport in the insulating and metallic states, superconductor-insulator transitions, disordered Josephson arrays. In the last decade, localization of interacting particles became one of the key problems in ultracold atomic quantum gases, which have temperatures in the nanokelvin regime and eight orders of magnitude lower densities than liquid helium. After first successful experiments in Orsay and Florence, the domain of quantum gases in disorder is rapidly growing. The aim of the present workshop is to bring together leading experts in condensed matter and atomic physics and to discuss recent developments in the field of disordered quantum systems. The discussion meeting, funded by CECAM Ile de France, will be focused on the fundamentals and applications of how matter reacts to thermodynamically applied gradients. Particular, but not exclusive emphasis will be on thermal and osmotic effects. We will try to make the connection between the molecular and the macroscopic scale of continuous theories. Finally, we want to put these two aspects in the broader perspective of thermodynamic gradients by following the example of multi-scale approaches successfully developed in the case of electrochemical and mechanical forcing. Oriol Bohigas was a creative and demanding theoretical physicist whose scientific activity has impacted many fields of physics, ranging from Nuclear Theory where he started his career, to various aspects of the field of Quantum Chaos of which he was one of the founders. His death on October 22 deprives us not only of a cherished friend and colleague, but also of a thoughtful and distinguished physicist. This colloquium aims at paying tribute to him by gathering leading experts on some of the questions to which he had dedicated his scientific life. Recent years witness an emergence and a very fast development of a new activity in condensed matter physics. The goal is a controlled transformation of electronic states or even of whole phases by external impacts. There are two main directions: the electrostatic effects of very strong electric fields and the supercritical optical pumping; the latest trend is to employ them in combination. Follow-up day of the conference "Unifying concepts in glass physics V" dedicated to young researchers. The motivation for the meeting was the feeling that the ongoing research activity, focused around the study of the structural glass transition in liquids at low temperatures and the theory of spin glasses, had lead to an increased appreciation of several universal aspects of glassy systems. Thus, it was felt desirable to bring together researchers conducting (mainly) theoretical and computational investigations on different aspects of glassy systems, in the hope of promoting an exchange of ideas on recent developments, and explore interactions between different approaches that may play a key role to address outstanding problems. ECRYS virtues: ECRYS provides cross-links between various communities engaged in studies of spontaneous superstructures formed by electrons in solids, with extensions to such related systems as charged objects in soft matter and biology, vortices in superconductors, magnetic and ferroelectric domains, etc. The goal is to bring together scientists who normally are involved in related problematic but are divided in several poorly-interacting communities oriented towards more focused schools and conferences, e.g. : on high-Tc superconductors, on strongly correlated systems, on hetero-junctions, on high magnetic fields, on oxides or organic conductors, on soft and bio matters. The statistics of rare events, and in particular Extreme Value Statistics, is by now a longstanding issue in the fields of engineering, finance or environmental sciences where rare and extreme events may have drastic consequences. After recent significant advances in the theory of complex and disordered systems, Extreme Value Statistics plays now a crucial role in statistical physics. It is thus not surprising that Extreme Value Statistics has emerged as an important problem in various areas of physics such as spin-glasses, fluctuating interfaces, polymers in random media, random binary-tree searches, random growth and combinatorial models and level-density problems of ideal quantum gases amongst others. Numerous individual researchers in France and groups abroad are actively working at the interface between physics and biology, in fields that range from classical biophysical subjects, e.g., cellular and tissue mechanics, to more molecular ones, such as regulatory and signaling networks, their evolution, and systems biology. Quantitative methods are becoming indispensable for rationalizing and understanding these systems which are benefiting from an explosion in the quality and amount of data produced through omics and imagery. The field has broad applications, from fundamental life sciences to medicine, building on both intense modeling and computational methods which are the driving forces behind the necessary interdisciplinary work. In particular, concepts from information theory and statistical physics have been instrumental in the development of powerful bio-computational methods, e.g., in genomics, population genetics and systems biology. The highly active and international nature of this field as well as its emergence in France makes it appropriate to bring the best of this research community for a top level conference at the University of Paris-Sud 11. The appearance of decoherence in closed quantum systems composed of discrete variables is the problem of practical importance because it is responsible for the noise generation in solid state qubits and of fundamental interest for solid state physics because it might lead to the appearance of novel low temperature phases in strongly disordered materials. At the same time it is also of a fundamental importance because it concerns the issue of reversibility in quantum mechanics. The aim of the workshop «Dynamics of quantum gases in one dimension» is to bring together experimentalists and theoreticians working with low-dimensional ultracold quantum gases, discuss the recent progress in the field, and formulate future directions of the research. The last few years have witnessed an interdisciplinary convergence of interest between the fields of statistical physics, information theory, computational optimization, and the analysis of complex systems in biology, such as regulatory networks and genetic phylogeny. Hot questions in computational optimization, biological information, and complexity will be presented, emphasizing how ideas from statistical physics can be useful in these disciplines. Topics covered in this workshop should include combinatorial optimization, message passing and the statistical physics of disordered systems, gene regulatory networks and sequence analysis, genomic, phylogenetic genetics, neural networks and the evolution in biological and social systems. Two-dimensional models are known to provide reliable descriptions of a wide array of physical phenomena, ranging from condensed matter (disordered electron gases, quantum liquids) to string theory (brane physics, AdS/CFT duality). Recent years have shown an extraordinary convergence of the methods used to study such models. The fruitful interplay between conformal field theory and quantum inverse scattering has been supplemented by mathematical methods coming from combinatorics, representation theory, and probability theory. Le but de cette école thématique du CNRS est de présenter une vue d’ensemble des sujets les plus actifs de la physique quantique mésoscopique, tant au niveau expérimental que théorique. LPTMS in collaboration with IFRAF is pleased to organize a two-day symposium "Quantum Fluids and Strongly Correlated Systems", which aims at gathering the leading experts in the rapidly developing fields of ultracold gases, strongly correlated systems, quantum fluids and solids, and many-body physics. L'Ecole de Physique des Houches accueille des physiciens du monde entier depuis 1951. Riche d'une histoire qui a vu les plus grands noms de la physique moderne y former de jeunes chercheurs débutants (dont certains recevront plus tard le prix Nobel de Physique), l'école perpétue une tradition d'excellence tout en s'adaptant aux évolutions de la science. Since its birth in the fifties, random matrix theory has been responsible for major advances in different fields of physics and mathematics, including mesoscopic and nuclear physics, quantum chaos, field theory and number theory. It has contributed to clarify and, to some extent, unify such disparate fields as the physics of disordered and chaotic systems, QCD, combinatorial and growth models, or the statistical properties of the prime numbers and Riemann zeros. In spite of its great success and maturity, the field is constantly developing. The conference will gather leading experts in different areas and focus on the most recent developments in the field. The workshop on "Quantum Dynamics And Noise In Interacting Disordered Systems" will focus on various topics related to level broadening, noise and dynamics in interacting quantum disordered systems. It will gather in particular researchers working in the areas of mesoscopic systems and quantum spin glasses. The structure will be focused on interactions and discussions, triggered by some talks from invited leading world experts. The workshop is open to anyone who has an interest in attending, but the participants should register on the web site. This workshop is sponsored by the Advanced Research Cluster "Triangle de la Physique" which groups teams working in condensed matter physics in Orsay, Palaiseau and Saclay, in the framework of the senior chair position awarded to Prof. Lev Ioffe. It is part of the activity of the Federation PHYSTAT-SUD.